Fungi are the group of eukaryotic organisms such as yeast, mold, and mushrooms. The present work investigated the impact of biofield treatment on different pathogenic species of fungi in relation to antifungal sensitivity pattern. Each fungal sample was divided into three parts: C, control; T1, treatment (revived); T2 treatment (lyophilized). Treatment groups received the biofield treatment, and control group was remained as untreated. Mini-API ID32C strip employed for evaluation of antifungal sensitivity and minimum inhibitory concentration (MIC). The results showed that sensitivity of Candida albicans in T1 cells was changed against itraconazole from intermediate (I) to resistance (R) on day 10. The Candida kefyr exhibited a change in susceptibility against itraconazole in T2 cell from S→I, on day 10. Likewise, Candida krusei showed the alterations in sensitivity against two antifungal drugs: fluconazole from S→I (T1 on day 10) and itraconazole S→I (T1 and T2 on all assessment days). The Cryptococcus neoformans changed from S→I in T1 cell on day 5 and 10, against itraconazole. Sensitivity of Candida tropicalis was also altered from I→R against flucytosine (T1 and T2, on all assessment days). Similarly, Saccharomyces cerevisae altered from S→I (T1) and S→R (T2) on day 10. The MIC values of antifungal drugs were altered in the range of 2-8 folds, as compared to the control. Fungal identification data showed the significant changes in species similarity of few tested fungi as C. albicans changed from 91.9% to 98.5 and 99.9% in T1 and T2 cells, respectively on day 10. C. krusei was changed from 97.9% to 85.9% (T2 day 10), and C. tropicalis was altered from 88.7% to 99.6% (T1 day 5) and 99.0% (T2). These findings suggest that biofield treatment could be applied to alter the susceptibility pattern of antifungal drug therapy in future. The kingdom fungi includes yeast, mold, and mushrooms that have multiple applications like fermentation of sugar and bear; productions of antibiotics and enzymes; as biological pesticide; and also consumed as food products like mushrooms, morels, and truffles. Apart from their beneficial applications, the fungi are also responsible for several topical and systemic diseases in living organisms. Some of the fungi also produce toxic chemicals like acetaldehyde that promotes free radicals generation in human body. This acetaldehyde also converted into ethanol by liver, and people report feeling like a drunk or hangover with debilitating fatigue [1,2]. C. albicans is an opportunistic fungus and commonly situated in the intestinal tract. It causes infection during the favorable condition and responsible for candidiasis in human. It produces secretory enzymes like phospholipase, proteinase, etc. that play a major role in the pathogenicity . C. kefyr is uncommon but considered as non-pathogenic fungus so far. However, due to its continuous resistance towards the existing antifungal drugs, it suddenly considered as an emerging pathogen, especially in patients with risk factors like immune-compromised and AIDS patients . C. krusei is budding yeast that is mainly used in chocolate production to remove the bitter taste of cocoa butter. Apart from this, it is an emerging nosocomial fungus and mainly found in the immune-compromised patients. Currently, C. krusei has been recognized as a potentially multidrug-resistant fungal pathogen, owing to its natural fluconazole resistance along with decreased susceptibility to flucytosine and amphotericin B . C. neoformans is unicellular opportunistic yeast, and its infection in human called as cryptococcosis. Generally, cryptococcosis occurs in lungs but fungal meningitis and encephalitis also reported in some AIDS patients . C. tropicalis is a yeast that usually responsible for human diseases in tropical countries especially in immune-compromised and immune-competent patients. Recently, infection of C. tropicalis has increased considerably worldwide, particularly against the recognized antifungal drug fluconazole . S. cerevisiae is a type of yeast and plays a central role in the spoilage of foods and beverages . However, despite of their beneficial effects in food and beverage industries, these fungi are harmful also to human being. Recently, biofield treatment is reported to alter the sensitivity of antimicrobials against several microbes [9,10]. Energy is the property of matter that neither can be created nor destroyed, however it can be transmitted to other substances by changing into different forms. According to the Einstein’s equation (E=mc2) the energy and mass are fundamentally related to each other. As like to energy in solid matter in the form of vibratory atoms or molecule; the human body also have the vibratory energy particles like neutrons, protons, and electrons [11,12]. The famous scientist Willem Einthoven developed an electrocardiography (ECG) in 1924 to measure the biofield of human body. Harold Saxton Burr gave the hypothesis that every single process in the human body has an electrical impact. Recently, it was reported that all the electrical process happening in body generates magnetic field that can be accessed by using some medical technologies such as electrocardiography (ECG), electromyography (EMG), and electroencephalogram (EEG). Therefore, the electromagnetic field generated from human body known as biofield and energy associated with this field is known as biofield energy [13-15]. Mr. Mahendra Trivedi’s biofield treatment (The Trivedi Effect®) is known to alter the crystalline, thermal, and atomic properties of various metals and ceramics [16-18]. The growth and anatomical characteristics of some herbs were also changed considerably after biofield treatment . In agriculture, the biofield treated crops have shown significant effect on growth, characteristics and yield . Further, the changes in antimicrobial susceptibility and biotype number of some microbes have been reported after biofield treatment [9,10,21]. In the present work, authors evaluated the effect of biofield treatment on different species of fungi in relation to antifungal drug sensitivity. The lyophilized samples of fungi [Candida albicans (ATCC 10231), Candida kefyr (ATCC 66028), Candida krusei (ATCC 14243), Cryptococcus neoformans (ATCC 14116), Candida tropicalis (ATCC 66029), and Saccharomyces cerevisae (ATCC 9763)] were procured from MicroBioLogics, Inc., USA. These lyophilized samples were stored as per the suggested storage conditions until further use. The antifungal susceptibility study and minimum inhibitory concentration (MIC) of all the fungal samples were carried out using mini API® ID32C strip. The antifungal drugs: amphotericine B, fluconazole, flucytosine, and itraconazole were procured from Sigma-Aldrich, MA, USA. The lyophilized fungi cells were divided into three groups: C, control; T1, treatment (revived); T2 treatment (lyophilized). The control group was remained as untreated; and treatment sample was handed over in sealed pack to Mr. Trivedi for biofield treatment under laboratory conditions. Mr. Trivedi provided the biofield treatment through his energy transmission process to the treatment group without touching the sample. After that, groups C and T1 were analyzed on day 5 and 10, while group T2 was examined on day 10, for antifungal drug sensitivity. The antifungal drug susceptibility and fungi identification were performed on mini API® ID 32C strips (ATB system) with MIC break point by observing the lowest antifungal concentration showing growth inhibition . API® ID 32C strips a simple and standardized method. It is widely accepted for identification of clinically important food and water-associated microbes using standardized biochemical tests. For every tested fungus, the biochemical reactions were analyzed by colorimetric assay. Based on this colorimetric assay, the digital analytical profile index (API) code was calculated. These codes then fed into the on-line ApiwebTM database, which gave the final output in the form of microbe identification . The sensitivity study was performed using four antifungal drugs: amphotericine B, fluconazole, flucytosine, and itraconazole. C- Control; T- Treated; I- Intermediate; S- Susceptible; R-Resistant. (8-16), R (≥ 32); Fluconazole: S (≤ 8), I (16-32), R (>64); Itraconazole: S (<0.125), I (0.25-0.5), R (≥ 1). Table 1: Effect of biofield treatment on fungal sensitivity. C-Control; T-Treated; MIC data are presented in µg/mL. The NCCLS recommended breakpoints (in mg/L) for Fungus species are as following: Flucytosine: S (≤ 4), I (8-16), R (≥ 32); Fluconazole: S (≤ 8), I (16-32), R (>64); Itraconazole: S (<0.125), I (0.25-0.5), R (≥ 1). Table 2: Effect of biofeild treatment on minimum inhibitory concentration (MIC) of antifungal drugs. that susceptibility of C. albicans was changed from I→S and I→R against itraconazole in T1 cells on day 5 and 10, respectively. However, it did not show any alteration in susceptibility patterns against fluconazole, and flucytosine as compared to control. The sensitivity of C. kefyr converted from S→I in T2 cell on day 10 against itraconazole only out of four tested antifungal drugs. The C. krusei showed the alteration in sensitivity of two antifungal drugs, i.e., fluconazole from S→I (T1 on day 10) and itraconazole S→I (T1 and T2 on all assessment days); however, the sensitivity to flucytosine remained same as control. Likewise, the C. neoformans was changed from S→I in T1 cell on day 5 and 10 against to itraconazole. Further, the C. neoformans did not show alterations in sensitivity patterns of remaining antifungal drugs with respect of control. The sensitivity of C. tropicalis was altered from I→R against flucytosine in both group T1 and T2 on all assessment days. Further, it showed the similar sensitivity pattern for fluconazole, and itraconazole as control. The sensitivity of S. cerevisiae was altered from S→I and S→R against itraconazole in T1 and T2 cells, respectively, on day 10; despite these, the sensitivity patterns against other three tested antifungal drugs were remained same as control. The sensitivity pattern of amphotericine B was not defined using mini API® method. 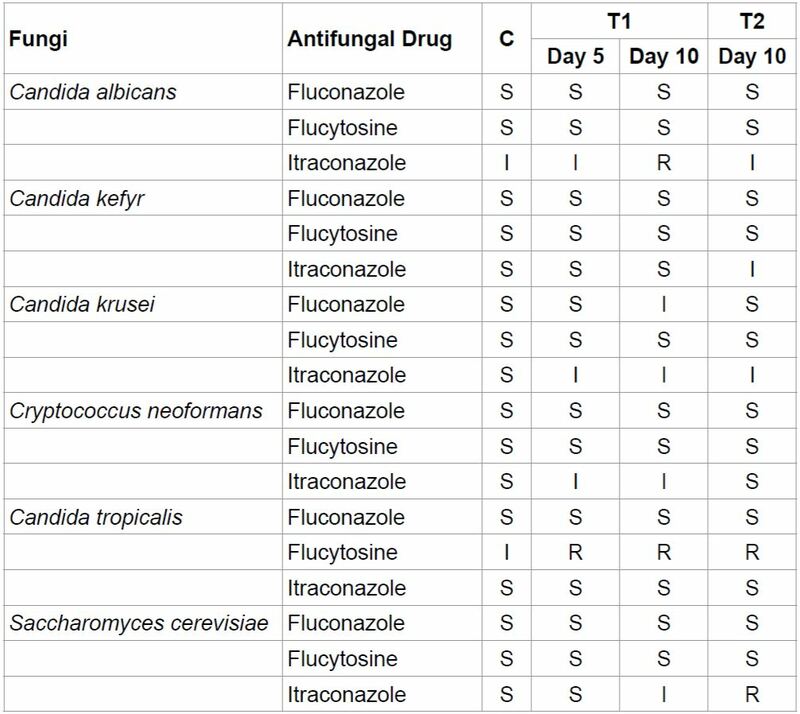 The MIC results of all tested antifungal drugs against six tested fungi are reported in Table 2. C. albicans showed the 4-folds increase in MIC value of fluconazole and itraconazole in T1 cells on day 10, as compared to control. It also showed the 2-folds increase in MIC value of fluconazole in T2 cell on day 10. The C. kefyr showed the 2-folds increase in MIC value of itraconazole in T2 cells with respect to control. A significant decrease (2-folds) in MIC values of amphotericine B and fluconazole was observed in T2 cells of C. krusei as compared to control. However, it also showed the 2-folds increase in MIC value of fluconazole in T1 cells on day 10 with respect to control. The C. neoformans showed the 2-folds increase in MIC of flucytosine and itraconazole in T1 cells on day 5 and 10 as compared to the control; additionally, 4-folds increase in MIC value of flucytosine was also observed in T2 cells of C. neoformans with respect to control. The treated cells of C. tropicalis showed 2-folds increase in MIC value of flucytosine in T2 group and 2-fold increase in MIC value of itraconazole in both T1 and T2 groups, with respect to control. Similarly, the treated cells of S. cerevisiae showed the increase in MIC of fluconazole (2 fold in T1 and T2 on day 10) and itraconazole (4 and 8 fold in T1 and T2, respectively on day 10) as compared to control (Table 2). The data of fungal strain identification study revealed the significant change in the identification of fungi sample like the species similarity of C. albicans was altered from 91% to 98.5% and 99.9% in T1 and T2, respectively on day 10 as compared to control. C. krusei exhibited a 7 alteration in species similarity from 97.9% to 85.9% in group T2. The species similarity of C. tropicalis was found to alter from 88.7% to 99.6% in group T1 on day 5, and 99.0% in group T2. Despite these, no other fungi showed the significant alterations in species similarity, as compared to control (Table 3). Table 3: Fungal strain identification. Over the past few decades, the persistent fungal infections have been emerged as a prominent cause of morbidity and mortality in immune-compromised patients. Unfortunately, huge consumption of triazoles in prophylactic and empiric antifungal therapy caused to selective drug-resistant against candida and aspergillus species . However, the naturally occurring resistance in fungi is very rare and slow as compared to the viral and bacterial resistance. The overall resistance in candida species against fluconazole and voriconazole is around 3-6% and it remained constant over a decade. Similarly, triazole resistance in A. fumigatus has been increasingly recognized about 6% over the past few years [24-26]. Therefore, severity of fungal infection is increasing recently and become more crucial due to the emergence of multidrug resistance against some antifungal drugs. Hence, in the present study we aimed to evaluate the effect of biofield treatment on six different species of fungi and analyzed against antifungal sensitivity and fungal strain identification. All fungi including Candida and Saccharomyces are usually susceptible to polyene and azole antifungal drugs [27,28]. The present study also suggested the similar type of sensitivity pattern in the control samples of tested fungi. The antifungal sensitivity results showed that sensitivity of itraconazole against C. albicans was changed from intermediate to susceptible in group T1 on day 5. That was further converted to resistant on day 10 (Table 1). 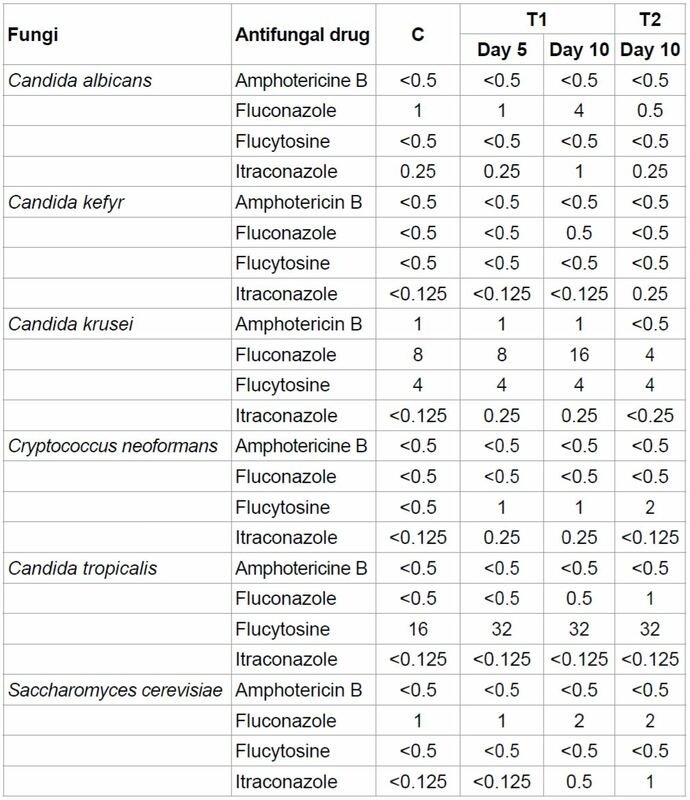 Likewise, the other tested fungi except C. tropicalis have showed the altered sensitivity patterns to itraconazole after biofield treatment (Table 1). The MIC values of tested antifungal drugs were increased in the range of 2-8 folds as compared to control (Table 2). The results of ATB identification method revealed the change in species homology like C. albicans was identified as 91.9 % in control that was increased to 98.9 and 99.99% in group T1 and T2, respectively. Some other tested fungi like C. krusei, and C. tropicalis also showed the significant change in the species homology as compare to control (Table 3). Overall, these results revealed that the changes might be occurred due to some alterations in the enzymatic or metabolic pathway or changes at cellular level of tested fungi after biofield treatment [29,30]. To the best of our knowledge, this is the first report describing the impact of biofield on the antifungal sensitivity and species homology of fungi cells. Altogether, the present study concludes that antifungal sensitivity and MIC values were altered after biofield treatment of tested six fungi. The species homology of few tested fungi was also changed in treated sample that may be due to some alteration at the genomic level or metabolic pathway of fungi. These observations suggested that biofiled treatment could be helpful to alter the susceptibility of fungi against the existing antifungal drugs. The authors would like to acknowledge the whole team of Hinduja Microbiology Lab for their support. We would also like to thank Trivedi Master Wellness™, Trivedi Science™, and Trivedi Testimonials for their consistent support during the work. 1. Mullar GM, Bills GF, Foster MS (2004) Biodiversity of fungi: Inventory and monitoring method, Elsevier academic press, London, UK. 2. Deacon JW (2006) Fungal biology, Blackwell publishing, Massachusetts, USA. 3. Ito KCY, Lyon JP, Vidotto V, de Resende MA (2006) Virulence factors and antifungal susceptibility of Candida albicans isolates from oral candidosis patients and control individuals. Mycopathologia 161: 219-223. 4. Weichert S, Reinshagen K, Zahn K, Geginat G, Dietz A, et al. (2012) Candidiasis caused by Candida kefyr in a neonate: Case report. BMC Infect Dis 12: 61. 5. Pfaller MA, Diekema DJ, Gibbs DL, Newell VA, Nagy E, et al. (2008) Global antifungal surveillance Group. Candida krusei, a multidrug-resistant opportunistic fungal pathogen: Geographic and temporal trends from the ARTEMIS DISK antifungal surveillance program, 2001 to 2005. J Clin Microbiol 46: 515-521. 6. Alanio A, Vernel-Pauillac F, Sturny-Leclère A, Dromer F (2015) Cryptococcus neoformans host adaptation: Toward biological evidence of dormancy. MBio 6. 7. Kothavade RJ, Kura MM, Valand AG, Panthaki MH (2010) Candida tropicalis: Its prevalence, pathogenicity and increasing resistance to fluconazole. J Med Microbiol 59: 873-880. 8. Loureiro V, Malfeito-Ferreira M (2003) Spoilage yeasts in the wine industry. Int J Food Microbiol 86: 23-50. 9. Trivedi MK, Patil S (2008) Impact of an external energy on Staphylococcus epidermis [ATCC-13518] in relation to antibiotic susceptibility and biochemical reactions-an experimental study. J Accord Integr Med 4: 230-235. 11. Planck M (1903) Treatise on Thermodynamics, third English edition translated by Alexander OGG, Longmans, Green, London, UK. 12. Einstein A (1905) Does the inertia of a body depend upon its energy-content. Ann Phys 18: 639-641. 13. Rivera-Ruiz M, Cajavilca C, Varon J (2008) Einthoven’s string galvanometer: the first electrocardiograph. Tex Heart Inst J 35: 174-178. 14. Burr HS (1957) Bibliography of Harold Saxton Burr, Yale. J Biol Med 30: 163-167. 16. Trivedi MK, Patil S, Tallapragada R.M (2014) Atomic, crystalline and powder characteristics of treated zirconia and silica powders. J Material Sci Eng 3: 144. 18. Trivedi MK, Patil S, Tallapragada RM (2013) Effect of biofield treatment on the physical and thermal characteristics of vanadium pentoxide powders. J Material Sci Eng S11: 001. 21. Trivedi MK, Bhardwaj Y, Patil S, Shettigar H, Bulbule, A (2009) Impact of an external energy on Enterococcus faecalis [ATCC-51299] in relation to antibiotic susceptibility and biochemical reactions-an experimental study. J Accord Integr Med 5: 119-130. 22. Nordin MA, Wan Harun WH, Abdul Razak F (2013) Antifungal susceptibility and growth inhibitory response of oral Candida species to Brucea javanica Linn. extract. BMC Complement Altern Med 13: 342. 23. Bruun B, Westh H, Stenderup J (1995) Evaluation of the ATB 32 C system for identification of clinical yeast isolates. Clin Microbiol Infect 1: 134-138. 24. Chakrabarti A (2011) Drug resistance in fungi- an emerging problem. Regional Health Forum 15: 97-103. 25. Paul S, Moye-Rowley WS (2014) Multidrug resistance in fungi: Regulation of transporter-encoding gene expression. Front Physiol 5: 143. 26. Gulshan K, Moye-Rowley WS (2007) Multidrug resistance in fungi. Eukaryot Cell 6: 1933-1942. 27. Martin MV1 (1999) The use of fluconazole and itraconazole in the treatment of Candida albicans infections: A review. J Antimicrob Chemother 44: 429-437. 28. Sojakova M, Liptajova D, Borovsky M, Subik J (2004) Fluconazole and itraconazole susceptibility of vaginal yeast isolates from Slovakia. Mycopathologia 157: 163-169. 29. Lindstrom E, Mild KH, Lundgren E (1998) Analysis of the T cell activation signaling pathway during ELF magnetic field exposure, p56lck and [Ca2+] i-measurements. Bioeletrochem Bioenerg 46: 129-137.